﻿ The Biggest Pitfall of Being a Generalist Marketing Agency » Red Mango Marketing! When you start a marketing agency, your first impulse might be to keep your focus general. After all, staying general will open you up to a broad range of clients, right? Getting too specialized might turn people away. But let’s be honest with ourselves for a moment. It’s nearly impossible for a small agency or lone consultant to be an expert in all areas of digital marketing. Staying on top of the latest marketing trends is not easy, and you risk spreading yourself too thin — which can lower the quality of service you’re providing to your clients. Why should you consider specializing instead? While offering a wide variety of services is tempting, knowing your strengths helps you stand out from the competition. Specializing gives you a better chance of becoming an expert in your field and allows you to focus your time. Which ultimately allows you to charge higher fees and attract better clients. What if one of your clients wants a service you don’t offer? Think about why your clients come to you. They come to you because they want to outsource to an expert. Take a page out of their book. If your clients are looking for a service you don’t specialize in, outsource or partner with an agency that does. Finding partners might be challenging at first, so look for agencies that are part of your network who you know will offer the same level of quality service. Is there a baseline of services that you should offer? Most marketing agencies tend to focus on a core set of services — such as web design, SEO, email marketing, social media marketing, and digital advertising. A good rule of thumb is to focus your brand identity on a couple of services that you enjoy the most and then offer a couple of supplemental services if they fit in well with your expertise. Once you decide to pursue a certain specialty, keep yourself open to new developments in your industry. Staying stagnant won’t do your business any good. For example, if your focus is email marketing, it’s likely you’re focusing a lot more on mobile-responsive templates than you were a few years ago. Stay up-to-date on best practices and shift your focus slightly when necessary. As counterintuitive as it seems, speaking to a broad audience won’t bring you the business you’re looking for. Your prospective clients want to work with an agency that understands their specific challenges and has plenty of expertise in that area. Embrace your niche and start attracting more of the right types of clients. Looking for ways to get more clients for your marketing agency? At Constant Contact, we help marketing agencies get in front of new clients and increase their revenue. 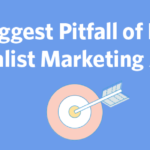 The post The Biggest Pitfall of Being a Generalist Marketing Agency appeared first on Constant Contact Blogs. This entry was posted on Thursday, May 18th, 2017 at 11:30 am	and is filed under Business Tips, Fresh Insights, News & Updates, small business marketing, Solution Providers. You can follow any responses to this entry through the RSS 2.0 feed. Both comments and pings are currently closed.